There’s order in the court — an order for season two of Judge Karen’s Court. It’s just been announced by the syndicated program’s distributor. According to THR, Litton Entertainment says that the newbie courtroom show will return with a new season of episodes this fall. It became the number one new first-run strip series on New York’s WPIX and has been renewed by some 57 nationwide stations already. 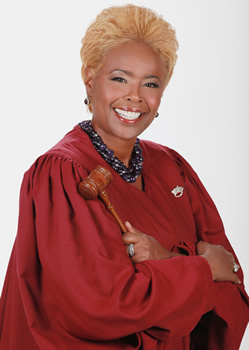 Daytime viewers may recall that Judge Karen Mills-Francis previously presided over the Judge Karen show. That was cancelled after one season in 2009 and, in many markets, it was replaced by Street Court. When that was cancelled after one season, it was replaced by Judge Karen’s Court with Mills-Francis back on the bench. What do you think? Do you like to watch Judge Karen’s Court? Is it better or worse than other court shows? How so? More about: Judge Karen's Court, Judge Karen's Court: canceled or renewed?, Syndicated TV shows: canceled or renewed? I like the Judge Karen show. Is it coming back? on another channel?